(Nanowerk News) GSM, UMTS, LTE, WiFi, Bluetooth – to name just a few of the wireless standards that have become a natural part of mobile communication today. For all these wireless standards, signal processing could not be done without the filtering of frequencies. Micro-acoustic piezoelectric resonators are the dominant technology in the market for this purpose. Theory predicts excellent oscillation characteristics for these resonators, if the electrode used for the excitation of the oscillation becomes very light. And the lightest conceivable electrode is electrically conductive graphene. "The metal electrodes, commonly used today, dampen the oscillation of the resonators through their mass – similar to the felt cover on a piano string – and therefore reduce the precision of signal separation in bandpass filters. While the metal electrodes cannot be arbitrarily thinned to reduce their mass and thus their damping, graphene still remains conductive even as an atomically thin electrode. ", explains Dr. René Hoffmann, head of graphene research at Fraunhofer IAF. With such thin graphene electrodes, the mechanical quality factors come close to the theoretical ideal. If the oscillation characteristics of the piezoelectric resonators can be successfully improved and if higher coupling factors are achieved, both the signal separation precision and the energy efficiency of the filters will increase. Here, the challenge at hand is to connect the nearly massless graphene electrodes with the currently used mobile communication components based on piezoelectric aluminum nitride. The new CVD-reactor for the deposition of graphene at Fraunhofer IAF. In future, a cost-efficient and simplified technology will make the deposition and the transfer of graphene onto aluminum-nitride-based bandpass filters possible. 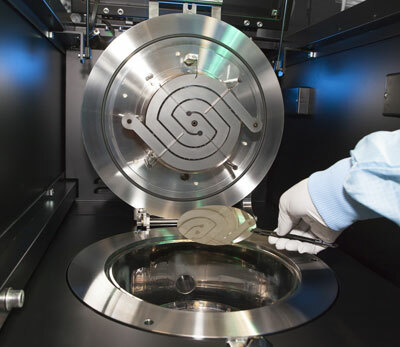 As one of the partners in the "Graphene Flagship", the largest funding initiative in the history of the European Union, Fraunhofer IAF is working on the development of an efficient technology for graphene deposition and graphene transfer onto aluminum nitride. As surprising as it may be to be able to manufacture and process graphene as atomically thin material at all – it is just as difficult to do so on an industrial scale. Many of the possible applications of graphene have not yet been successful since the production of the material is still too complex. Hence, the development of economical manufacturing and processing technologies is essential for the use of the outstanding theoretical properties of graphene in practice. A promising approach for the realization of graphene deposition on substrate sizes typical for the semiconductor industry can be found in chemical vapor deposition. Here, a catalyst surface such as copper is heated to nearly 1000 °C until gas containing carbon is broken down on the hot surface and reorganized into graphene. In future, this method is supposed to be further developed into a technology compatible for industry applications, to directly integrate graphene into existing aluminum-niride-based bandpass filters.